What best practices and practical implementation insights are available for organisations to deliver outcomes in their Client Journey, Risk Management & AFC? An interactive design thinking industry session of leaders and practitioners from Business, CIO, COO, Data, AFC, Innovation and Change functions will assess the opportunity and discuss practical ways of overcoming the barriers to AI adoption. 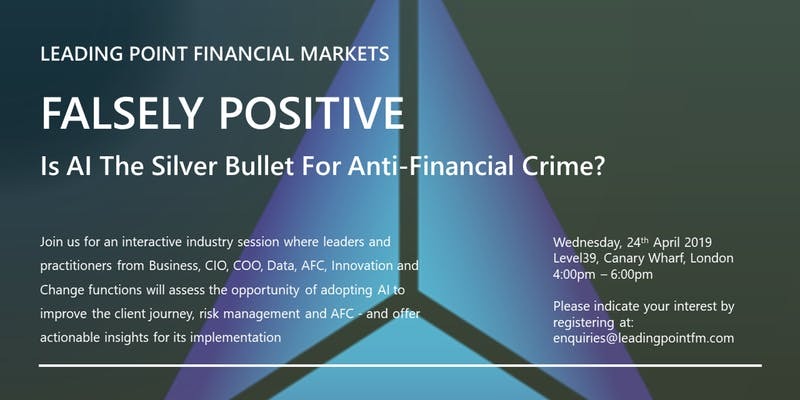 Leading Point Financial Markets is thrilled to be hosting this event on April 24th at Level 39 in Canary Wharf. Firms are facing huge pressure to improve their Anti-Financial Crime (AFC) capabilities in 2019. The combination of new and evolving regulation, firms’ operational complexity and increases in cyber crime have led to dissatisfied clients, poor risk management, massive compliance costs and increased competition from challenger banks. This situation is only getting worse as shortage of expertise, cultural resistance to change, and depleted internal resources create barriers to digital transformation in a fragmented solutions marketplace. Maturing Artificial Intelligence (AI) technology is being positioned as ‘the answer’ – some estimating it can reduce costs in AFC by as much as 47%. ** How can organisations grasp the AI opportunity? Is AI a Silver Bullet or a Red-Herring? WHERE CAN DATA-DRIVEN AI APPROACHES HELP? What outcomes do organisation stakeholder groups seek from their Client Journey, Risk Management and AFC Operating Models? Business: Reduce onboarding and maintenance bottlenecks to allow demonstrable acceleration in timelines and an improved client journey. COO & CTO: Improve the efficiency, accuracy, and adaptability of screening and transaction monitoring workflows to provide efficiency gains and improved KPIs. Regulatory & Compliance: Automate governance of complex models and reporting tools to support regulatory review and better enforce policy to maintain compliance. Put compliance in the front-line, at the heart of the business. Risk Management: Segment clients according to contextual and transactional behaviour to create dynamic risk profiles to better evaluate emerging AFC threats, risk thresholds and enable deeper, and more granular, understanding of clients.